Minox 8x43 is a high-end binocular made in Germany. This all-round model offers high-performance using the best materials in optics industry. It’s suitable for wide variety of applications such as bird watching, hunting, sports, traveling, safari etc. in densely wooded areas to track smaller, fast moving subjects due to extended FOV. This model is an award-winning masterpiece that amazes at incredible optics features. The lenses are apochromatically-corrected (APO) that significally improves optical performance. Lifelike images when looking through extra-low dispersion SCHOTT glass are incredibly bright, sharp and colorful. 21 layers of M* lens coatings and MinoBright silver-bearing prism cotting that helps with light transmission will never cease to amaze. Award-winning binoculars also have incredible aesthetic and ergonomic design. Stylish black rubber armor for solid grip and magnesium body that makes this APO HG very lightweight significally ease your portability. Waterproof and fog-prof construction is the result of argon gas purged housing with O-ring seals, making these binoculars impervious during extreme weather conditions. MINOTEC technology also helps you quickly clean external lenses of dust and dirt partickles. For adjusting the focus APO HG is equipped with very quick and smooth central focus wheel and right eye diopter. The other very prominent mechanisms are Quick-Close-Focus and Distance-Scale, very convenient for shooting and dynamic situations when following smaller, fast moving subjects. 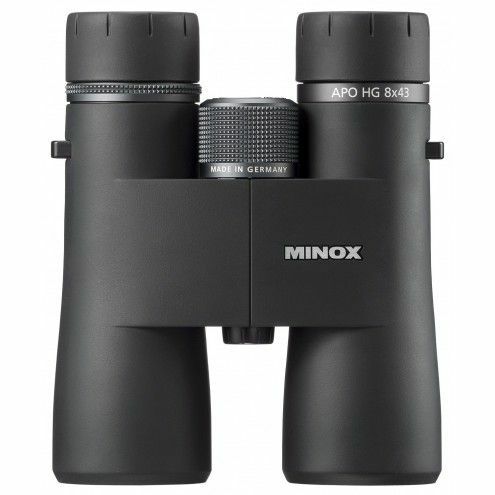 APO HG-High Grade binoculars from Minox Company are a high-end models made in Germany, the city with biggest knowledge and experiences in optics, Wetzlar. Advanced optic system provides apochromatically-corrected SCHOTT extra-low dispersion glass for the highest performance. 21 layers of M* lens coatings and MinoBright silver-bearing prism coatings offers incredible lifelike images. Using the best materials to enhance light transmission and gives you clearer and sharper lookthrough, APO HG binoculars are a real pleasure to use. Together with incredible level of build technology, these award-winning binoculars in design offers very comfortable and balanced ergonomy. Stylish black rubber armor for a firm grip and lightweight magnesium body ease your portability. Amazing protective features are the result of argon gas purged housing against internal fogging and O-ring seals impermeable to water, dust and debris getting inside the construction. MINOTEC technology will help with a quick-clean of external lenses. You can use them in extreme weather conditions and never have to worry about corrosion. Getting a perfect image can be achieved by different advanced mechanisms. Very smooth and quick central focus with right eye diopter that eliminates differences in your eyes are one. Extended FOV together with quick-close-focus helps you to follow moving objects and distace-scale is incredibly useful when you have to measure distance to the observed object when shooting.